George Franklin Grant, DMD 1870, was the second African American graduate of Harvard Dental School (now the Harvard School of Dental Medicine) and the second African American dental school graduate in the country. He was also the first African American faculty member at Harvard University. In addition, he was a successful Boston dentist and inventor of dental prosthetics and of the modern golf tee, among other inventions. His story reaches back through the time of slavery in the United States and forward to the era when Harvard Dental School was the only dental school in the country to admit African American students. Here is the compelling story of Dr. George Franklin Grant. Grant’s comfortable existence was short lived, however. After a particularly spirited argument between 15-year old George and his father concerning suitable clothing for a youth of his age, the younger Grant moved out of his home. Forced to support himself, he was hired as an errand boy by a local dentist and soon became his laboratory assistant, learning the basics of dental practice for five years. In 1867, at the age of 21, Grant moved to Boston. While Tudor Grant campaigned against slavery in Oswego, a similar fight was raging in Boston, the home of abolitionist luminaries William Lloyd Garrison, William Cooper Nell, Lewis Hayden, and Charles Sumner. Boston came to be seen as the epicenter of the American antislavery struggle. Thus, both former slaves and free persons flocked to the city following the Civil War, hoping to find opportunities for educational and economic advancement. It was as one of these migrants that George Grant made his way to Boston and, once there, boarded with the prominent African American John J. Smith. A migrant himself, having arrived in Boston from Richmond, Virginia, in 1848, Smith became a well-known abolitionist in the antebellum period, housing fugitive slaves on their way along the Underground Railroad in the basement of his barbershop. The assistance Smith provided Grant had greater significance than merely the provision of a place to sleep. As a resident of Beacon Hill, Smith lived a stone’s throw away from the newly established Harvard Dental School, which was founded in 1867; thus, Grant came to reside in the center of a community in which he would later become a prominent figure and near the institution in whose halls he would begin his journey to great success. Armed with some basic education and his previous dental experience from Oswego, Grant was hired as a laboratory assistant at Harvard Dental School. He demonstrated enough skill to be invited to attend the School, matriculating the following year. After graduating with distinction as one of 12 students in the Dental School’s Class of 1870, Grant was hired as an assistant in the Department of Mechanical Dentistry in 1871. He was a pioneer in treating patients with cleft palate, a congenital condition in which the bones and soft tissue in the roof of the mouth are not closed. Acutely aware of the social implications for patients with a condition in which speaking and eating was difficult, Grant was widely known both nationally and internationally for his skill in treating this condition. He invented and patented a prosthetic device he called the oblate palate, worn by patients to help their palates move into proper physical alignment and allow them to speak and eat more normally. In 1884, he was elevated to the post of Instructor in Treatment for Cleft Palate and Cognate Diseases, a faculty appointment, which made Grant the first African American professor at Harvard University and the nation’s first African American dental education faculty member, in addition to being the School’s second African American graduate. He left Harvard after 19 years as an innovator and educator to open his own successful dental practice — apparently counting Harvard University President Charles Eliot among his patients, who came from as far away as Canada and Michigan to seek treatment. Grant remained connected to the School as a member, and later president, of the Harvard Dental Alumni Association. 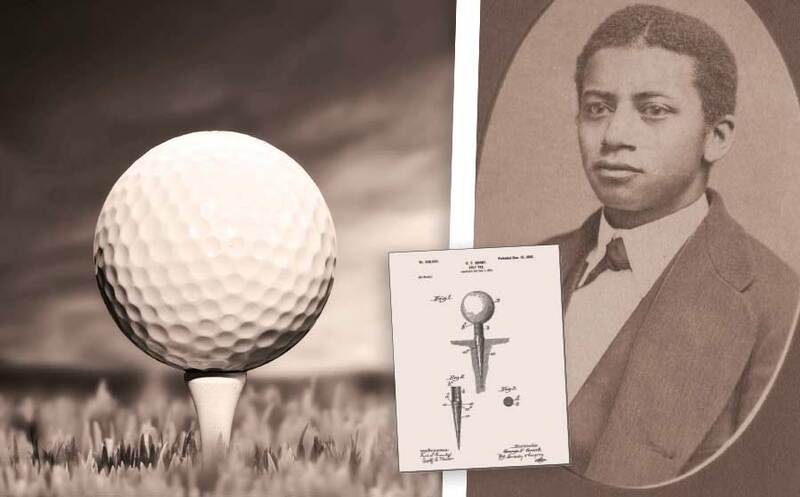 In addition to Grant’s renown as a dentist, he was a passionate golfer; considerable evidence points to Grant and his golfing partners as some of the earliest African American golfers in the post–Civil War era. His daughter, Frances, recalled caddying for her father in the 1880s in the Boston suburb of Arlington Heights, where her father had built a meadow course next to his home in the country. The family had moved to Beacon Hill, but in his free moments Grant returned to the course in Arlington Heights. One aspect of the golf game frustrated him, however. He was unhappy with the imprecise, messy, and unsanitary process of teeing up the ball, which required pinching moist sand to fashion a coned-shaped tee. Searching for a better method, Grant came up with an invention that would forever change the game of golf. Already a patented inventor, on December 12, 1899, he received US patent No. 638,920, the first patent for a wooden golf tee. It is described as a rigid base portion and an attached flexible head, the base being preferably made of wood and tapering to a point at its lower end to be readily inserted in the ground. The tee had a gutta-purcha crown — a latex resin used in dentistry — with an annular seat on which the ball would rest as in a cup, resembling today’s modern tee. As an inventor rather than a businessman, Grant never marketed his golfing innovation. His tees were manufactured in Arlington, and he passed them out by the handful to friends and playing partners. In 1910, at the age of 64, Grant died at his vacation home in Chester, New Hampshire, of liver disease. More than 80 years later, in 1991, the United States Golf Association recognized Grant for his contribution to the game. George Grant’s life was one of singular achievement, his accomplishments all the more remarkable given the times in which he lived. To honor Dr. Grant’s legacy, preserve his story, and improve the diversity of the student body at the Harvard School of Dental Medicine, the School intends to establish an endowed scholarship in Grant’s name that would pay tuition and fees through the four years of predoctoral (DMD) study for an extraordinary student (or students).